I’ve written about dumpster diving and other forms of admirable scavenging before. I said that I wasn’t personally excited by the idea because (a) I’m a minimalist, decidedly more likely to get rid of something than to salvage something and (b) I’m a squeamish nincompoop, seldom a stonesthrow from a thing of hand sanitiser. But finally, something has arrived to get me properly excited about the ethics and practices of salvage. Escapologists, I want to draw your gaze toward this blog, run by a fellow called Martin. It is unashamedly and amusingly titled Things I Find in the Garbage. It’s about things he finds in the garbage. Martin walks and cycles around Montreal in search of objects prematurely discarded or abandoned by their former owners. He then cleans them up and in some cases repairs them. 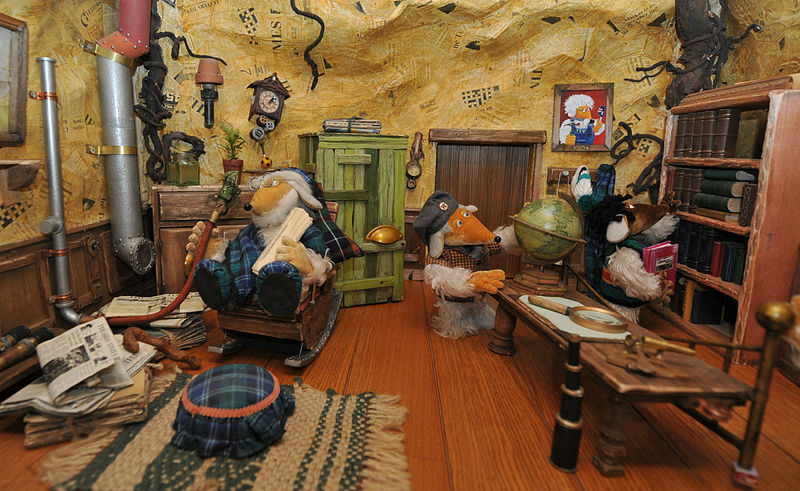 He’s a regular Womble and this blog charts his adventures. And it’s fascinating. It is not unusual for Martin to find the contents of entire apartments on the street: the furniture, crockery, and record collections of people who have died. It often doesn’t look like much when its all piled up on the curb: the material sum of a life forlornly squatting in the elements. Bereaved family and friends don’t have time or energy to sort through a person’s former belongings so it just gets unceremoniously jettisoned by an efficient landlord. This is probably my favourite kind of garbage story: as a minimalist it reminds me of the pointlessness of too many material possessions. What will become of your treasured goods upon your demise, after years of dusting them and rearranging them and loading them into removal vans whenever you’ve moved house? Why, they’ll probably end up ditched in a street. Now that the winter has been all but banished from our island city, Martin has decided to dedicate an entire spring and summer to his project. The point being to provide proof of concept for another alternative to ‘work’. He’ll also be committing to the three Rs by manfully intercepting things on their way to landfill. It’s a charming and funny blog destined to fully kick into life this summer. As some of you will remember from Issue 4, or perhaps from Being and Nothingness, Jean-Paul Sartre discusses the fawning and overly-deliberate actions of a cafe waiter. The accusation is that the waiter exhibits bad faith: in throwing himself fully into the role of waiter he is denying his ultimate free will. It is possible, however, to turn this analysis around, as some critical Sartreans have done, and to defend the poor waiter. Gary Cox, in his excellent The Existentialist’s Guide to Death, the Universe and Nothingness, argues that the waiter, far from being deluded that he really is a waiter, is consciously acting “with ironical intent”. In this sense, he is a paragon of Sartrean authenticity, because “he strives to take full responsibility for the reality of his situation, choosing himself positively in his situation by throwing himself wholeheartedly into his chosen role”. This is a stunning idea. I really like it. But it doesn’t quite cut the mustard for me. Leading a life defined by one’s occupation is the very essence of bad faith, it being the condition in which people cannot transcend their situations in order to realise their human fallibility and their lack of immortal, conceptual waiterliness. Still, it’s a great way of letting employed people off the hook. God knows they have enough problems as it is. Perhaps we should be kind and extend to them the benefit of the doubt, if only to cut them loose from our own ledger of concerns. When contemplating the importance of something like career or personal legacy, I like to regain perspective by considering cosmic scale. (Yes, I know he’s called the “star child”, but “wise space baby” is funnier to me).